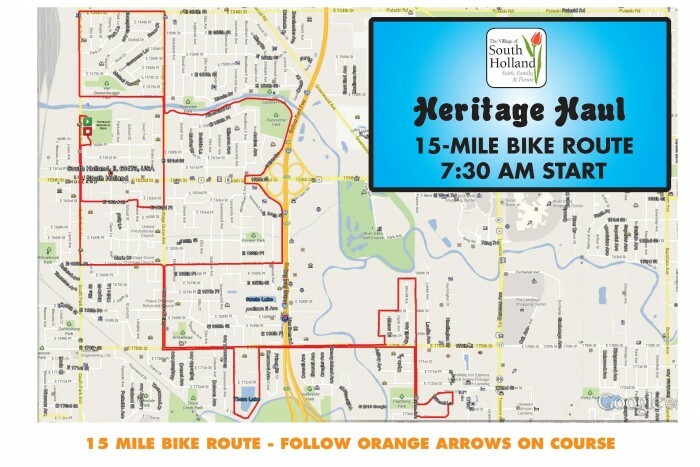 South Holland's 11th annual Heritage Haul! 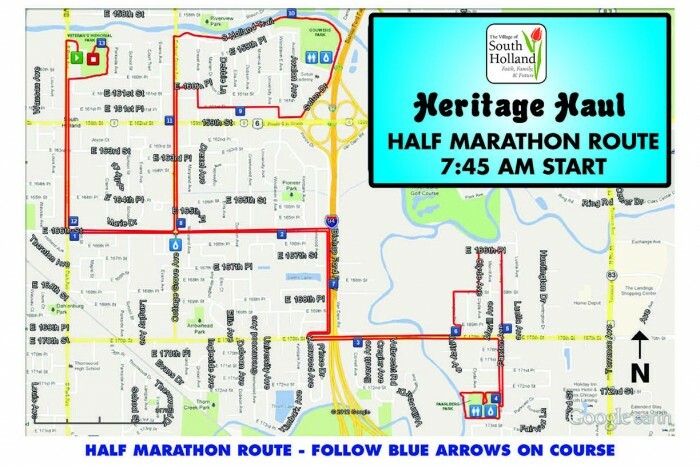 Run or bike in beautiful Village of South Holland. Choose from 5k, 10k, Half Marathon or 15 mile bike distance. An awesome race bag is included with the registration, and is filled with a long-sleeve race shirt (while supplies last), sunglasses, brag bracelet, race sticker and tattoo, key chain, and more. Check out the photo board to capture your special race moment. Cash Prizes and medals presented immediately after race! Race bag (including volunteers) pick up location has changed! Pick up at the South Holland Village Hall - 16226 Wausua Avenue. If registering in a team (minimum of 5 people), each member will receive a $5.00 discount. Wednesday, September 14, 9:00 a.m. – 6:30 p.m.
Thursday, September 15, 9:00 a.m. – 6:00 p.m.
Friday, September 16, 9 a.m. - 5 p.m.
**If you cannot make it on Wednesday, Thursday or Friday, you are welcome to have a friend or family member pick up your race bib, shirt and goodie bag for you at the Village Hall. Please send them with a copy of your registration confirmation. You may also pick up your race bib, shirt and goody bag on race day. A 15-minute mile pace or faster is required for the half marathon, 10K, and 5K race distances (approximately four miles per hour, equivalent to a very brisk walk). 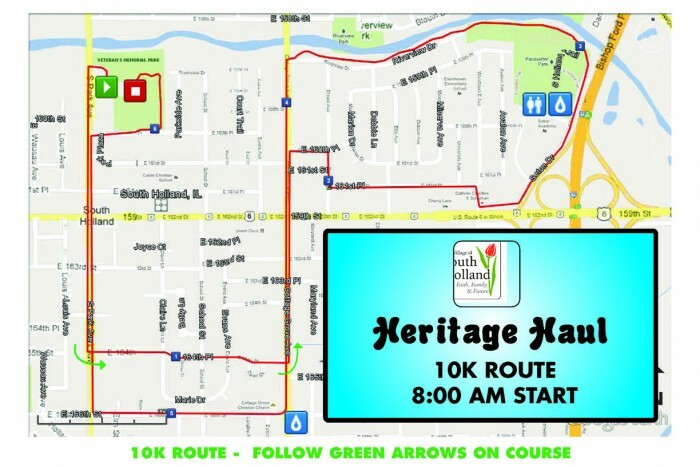 If you fall below this pace, the Heritage Haul race organizers cannot guarantee course support, as road closures, water stations, and medical support will begin to become unavailable to participants. 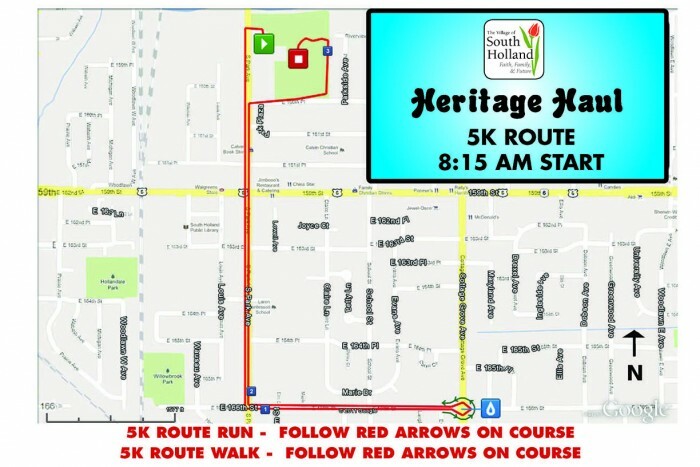 The local police and race organizers will ask you to either move up onto the sidewalk or require you to be transported further up on course to catch up to the 15-minute per mile group. Gear Check – 6:00 a.m. – 11:00 a.m.
Gear check will be available to all registered participants under the picnic pavilion at Veterans Memorial Park. You will receive a wrist ban, which will serve as your claim check for your gear. The Village of South Holland is not responsible for lost, stolen or damaged items. Medical support will be provided at the finish line, as well along the course as needed. Pre-race water will be provided. A refresh station will be provided for race participants. Refreshments may include apples, bananas, raisins, granola and protein bars, etc. Only cash prizes will be announced at the event. Half marathon runners will receive a finisher’s medal at the designated station. All race divisions will have separate pick-up stations for 1st and 2nd place medals. Stations will be clearly marked with banners.